Given its perverse political and regulatory climate, it should not be a surprise that NextEra Energy is exiting Hawaii. 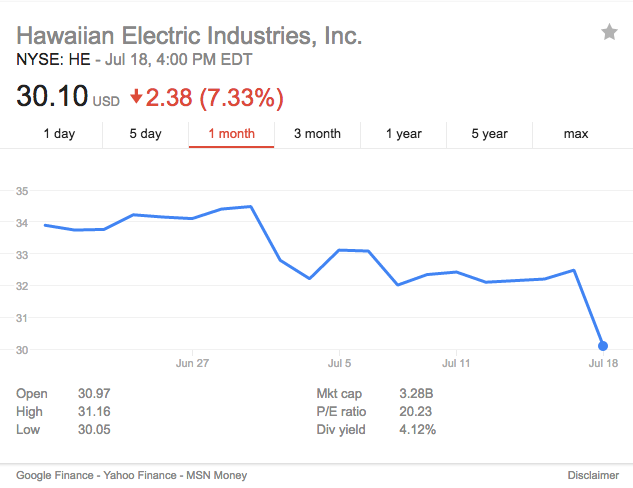 The downward decline in Hawaiian Electric Industries' stock price shown below correlates to Governor Ige's appointment of Tom Gorack on June 29, the release of the Hawaii Public Utilities Commission (HPUC) Order on Friday and NextEra's subsequent exit early this morning. 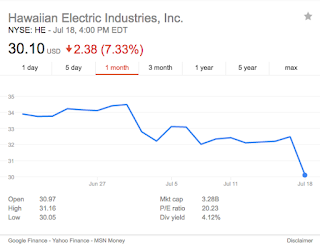 Between the period of June 29 and 4 p.m. today, when the stock market closed, my estimate of local value destruction (shares with Hawaii ties) is around $120,000,000. I wrote a post on July 1 on the fallout of the Gorack appointment. What I said is worth repeating as the PUC's actions and NextEra's exit are no longer speculative, resulting in value destruction affecting Hawaii shareholders and the likelihood of higher financing costs which, ultimately, will be passed on to electricity customers.
. . . given HECO's weakening financial position and lacking a stabilizing factor like NextEra's financial strength, the future outlook does not bode well given all this uncertainty. Prior to the merger application, HECO's credit rating by Standards and Poor was BBB-, one notch above non-investment grade. The merger application stabilized HECO's credit worthiness with a neutral outlook given NextEra's strong financial position. With Hawaii's unstable regulatory and unfriendly business climate, and without a strong financial partner, there could be a propensity to affect HECO's credit rating downward, without any cushion or safety net, it would be to non-investment grade level. Like Brexit, it is much too late for regrets. Without a clear pathway to ensure a stable business climate and an improved regulatory environment, the damage will be ongoing with increased costs passed on to electricity customers. With Nexit now in place, the $60 million in rate credits and potential $1 billion in state-wide benefits that the Hawaii Public Utilities Commission refused to acknowledge disappears. What remains is the price tag for the needed infrastructure improvements to realize the State renewable energy goals with no corresponding savings to help offset the price tag. There is no Plan B by the PUC/Ige Administration on how to recover these customer savings offsets except to hope for a generous suitor to appear. No matter who owns the company, the energy vision for Hawaii remains clear - 100 percent renewable energy with a transformation to a customer-centered utility focusing on smart meters, smart grid, distributed local solutions, and as much consumer choice as possible. Who owns the company does matter to give Hawaii the best chance for success by minimizing risk, maintaining service accessible and reliable and keeping rates affordable. Linear thinking and relying on mantra-like soundbites like "100% renewables" or "no-fossil fuels" or even "local values" or "local ownership" does the public a disservice, as it is vague and insufficient to convey the difficulty and reality of the technical challenges and the cost and effort that will be required to attain such a future. One's vision must align with the practical realities of execution and with one's values on how to achieve the vision with integrity. Nexit created a big implementation puka for Hawaii's 100% renewable vision to fill.